The global implantable cardiac monitor market is expected to reach a market value of about US$ 1,464.26 Mn by the end of 2026, expanding at a high single digit CAGR during the forecast period. Rise in the prevalence of cardiac arrhythmia such as atrial fibrillation and bradycardia is likely to boost the global implantable cardiac monitor market. Moreover, technological advancements and rise in the geriatric population across the globe are projected to drive the market. Furthermore, rise in the prevalence of stroke, adoption of and awareness about prolonged ECG monitoring of the heart rhythm, improvements in health care infrastructure, and rise in demand for subcutaneous implanted cardiac monitors are some factors that are expected to boost the global implantable cardiac monitor market during the forecast period. Rise in investments by key players through collaborations, mergers, and acquisition and increase in demand for the development of miniature devices are expected to propel the global implantable cardiac monitor market in the next few years. However, the implantation of cardiac monitors is a time consuming process. This is likely to hamper the market. Moreover, high cost of treatment and stringent regulations related to the approval of implantable devices are expected to hamper the implantable cardiac monitor market. Nevertheless, smartphone compatible cardiac monitors are likely to offer attractive investment opportunities to the global market. The global implantable cardiac monitor market has been segmented based on arrhythmia, end-user, and region. In terms of arrhythmia, the global market has been classified into atrial fibrillation, bradycardia, and others. The atrial fibrillation segment dominates the global implantable cardiac monitor market. The segment is likely to expand at a significant CAGR, owing to an increase in the geriatric population across the globe. The bachycardia segment is expected to expand at a significant CAGR, owing to the higher prevalence of cardiovascular indications. Bachycardia is very common in athletes. In the condition, the heart rate comes down to less than 60 per minute. In terms of end-user, the global implantable cardiac monitor market has been classified into hospitals, specialized cardiac centers, and ambulatory surgical centers. The hospitals segment held a major share of the market in 2017, followed by the ambulatory surgical centers and specialized cardiac centers segment, owing to the implantation surgical process requiring hospitalization. The ambulatory surgical centers segment is projected to expand at a considerable CAGR during the forecast period, owing to supporting personal care, low cost of treatment, and the ready availability of treatment in ambulatory surgical centers compared to crowded hospital. In developing countries, medical care is not funded completely by the government. Therefore, ambulatory surgical centers are easily accessible and are advantageous to patients. In terms of region, the global implantable cardiac monitor market has been segmented into North America, Europe, Asia Pacific, Latin America, and Middle East & Africa. 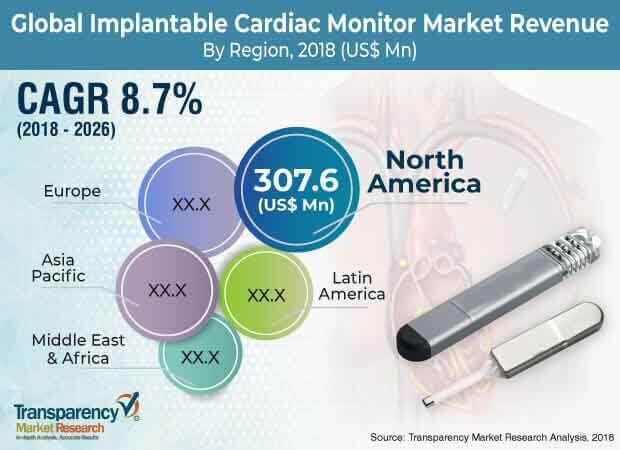 North America dominates the global implantable cardiac monitor market, owing to high acceptance of implantable loop recorders, high health care investments by the government, rise in the incidence of cardiac arrhythmia, and presence of major players in the region. As per research, in the U.S., approximately 14 million people are suffering from some form of cardiac arrhythmia. This, in turn, attracts more investments in research & development for the monitoring of heart disease. Europe is a prominent region of the market. The market in the region is likely to expand at a significantly high CAGR during the forecast period, owing to a rise in the prevalence of atrial fibrillation. Moreover, rise in the geriatric population, increase in obesity, and improvements in survival after cardiovascular events are likely to offer prominent opportunities for the increasing usage of cardiac monitoring devices. Major players operating in the global implantable cardiac monitor market include Medtronic, Abbott, Biotronik Angel Medical Systems, Inc., vectoriousmedtech.com. Boston Scientific Corporation or its affiliates, and Biosense Webster, Inc. Key players are focusing on developing more implantable cardiac monitor devices with significant investment support from the government or funding from giant pharmaceutical companies. There are very few players in the market for internal cardiac monitors, which also acts as an opportunity for key players to explore this area of innovative technology. This report analyzes the current and future scenario of the global implantable cardiac monitor market for the period 2018 to 2026. Rise in atrial fibrillation indication, increase in the geriatric population, rise in the prevalence of cardiac arrhythmia, and high unmet medical needs are likely to be major drivers of the global implantable cardiac monitor market during the forecast period. The global implantable cardiac monitor market report comprises an elaborate executive summary, including a snapshot that provides information on various segments of the market. It also provides information and data analysis of the global market with respect to segments based on arrhythmia, end-user, and region. A detailed qualitative analysis of drivers, restraints, and opportunities of the market has been provided in the market overview section. Additionally, the section comprises a competitive matrix and profiles of key market players, along with business overview, to project the competitive landscape of the market. The section also provides market attractiveness analysis based on region and market share analysis in terms of key players, thereby presenting a thorough analysis of the overall competitive scenario in the global implantable cardiac monitor market. Based on arrhythmia, the global implantable cardiac monitor market has been segmented into atrial fibrillation, bradycardia, and others. The segments have been analyzed based on available products used during the treatment of chronic diseases and cost-effectiveness. Based on end-user, the global implantable cardiac monitor market has been divided into hospitals, specialized cardiac centers, and ambulatory surgical centers. Market size and forecast for each of these segments have been provided for the period 2018 to 2026, along with their respective CAGR for the forecast period 2016 to 2026, considering 2017 as the base year. In terms of region, the global implantable cardiac monitor market has been segmented into five major regions: North America (the U.S. and Canada), Europe (the U.K., Germany, France, Spain, Italy, and Rest of Europe), Asia Pacific (India, China, Japan, Australia & New Zealand, and Rest of Asia Pacific), Latin America (Brazil, Mexico, and Rest of Latin America), and Middle East & Africa (South Africa, GCC Countries, and Rest of Middle East & Africa). Market size and forecast for each of these regions and the mentioned countries have been provided for the period 2018 to 2026, along with their respective CAGR for the forecast period 2016 to 2026, considering 2017 as the base year. The research study also covers the competitive scenario in these regions. The report also profiles major players operating in the global implantable cardiac monitor market based on various attributes such as company overview, financial overview, product portfolio, business strategies, and recent developments. The players covered in the report include Medtronic, Abbott, Biotronik, Angel Medical Systems, Inc., vectoriousmedtech.com, Boston Scientific Corporation or its affiliates, and Biosense Webster, Inc.